Addresses the insurance needs of U.S. citizens and U.S. permanent residents who are 65+ and who need temporary medical insurance while traveling outside the U.S.
You have enough to worry about when you're traveling. Don't let your medical coverage be an uncertainty. 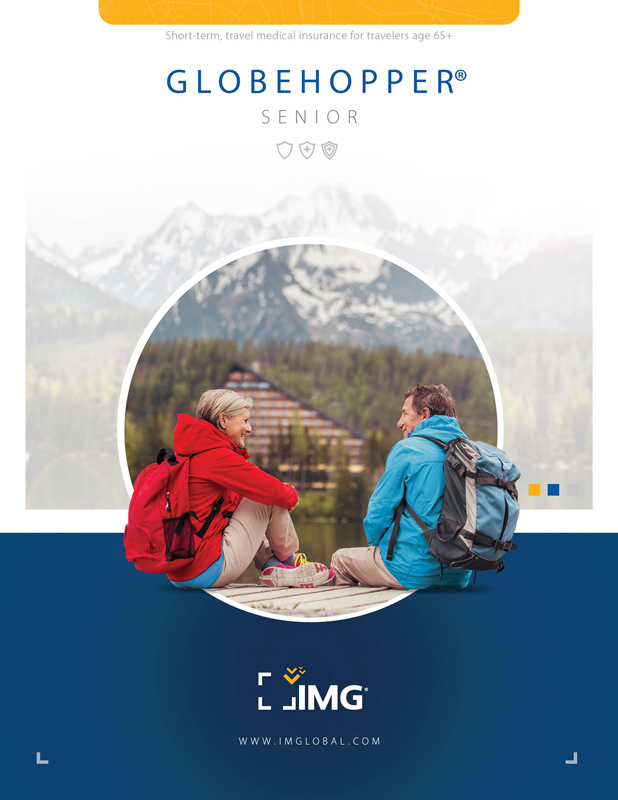 IMG has developed two GlobeHopper® Senior plan options that offer market-leading, affordable travel medical insurance that bridges the gap left by other limited domestic plans that do not cover seniors when they leave the U.S. GlobeHopper Senior Single-Trip helps protect travelers who need travel medical insurance coverage from five days up to 12 months while on a single trip. GlobeHopper Senior Multi-Trip offers flexible protection to frequent travelers who prefer to purchase an annual plan to cover multiple trips throughout a 12-month period, with each trip covered up to a maximum of 30 days. Additionally, the plans offer excellent benefits and services to help meet your global travel insurance needs. You have access to IMG's international, multilingual customer service representatives, claims administrators who process claims from all over the world, handling virtually every language and currency, and 24-hour access to highly qualified coordinators of international emergency medical services and treatment. You can also choose from a wide range of deductibles, several maximum limits, and you have access to more than 17,000 providers through our International Provider AccessSM (IPA) when traveling and requiring treatment outside the U.S. Eligible individuals are: 65 years of age or older, U.S. citizens and U.S. permanent residents, Qualified for Medicare, actively enrolled in Medicare Parts A & B and enrolled in a Medigap Plan or Medicare Advantage Plan, This plan is secondary to Medicare, a Medigap and/or a Medicare Advantage Plan and provides coverage for medical expenses outside the U.S. only. The GlobeHopper Senior Single-Trip is eligible to be extended up to 12 months from the initial effective date, provided there is not a break in coverage. Extensions are available in daily and monthly increments and may be completed online or by using a paper application; however, extensions of less than one month are available online. For each extension less than one month that is completed online, you will be charged an additional $5 processing fee. Each insured person must only satisfy one deductible within each 12-month coverage period. Your satisfaction is very important to IMG. If you are not pleased with this product for any reason, you may submit a written request, within 5 days from the effective date, for cancellation and refund of your premium. You may request cancellation of your coverage after the review period if you do not have any claims filed with IMG, however, the following conditions will apply: 1) you will be required to pay a $50 cancellation fee and 2) only full month premiums will be considered for refunds (e.g., if you choose to cancel your coverage two months and two weeks prior to the date your coverage ends, IMG will only consider the two full months for a refund). If you have filed claims, your premium is nonrefundable.